These wide-ranging conversations have an exceptionally open and intimate tone, giving us a personal glimpse of one of the most fascinating figures in contemporary world literature. Interviewer Fernando Sorrentino, an Argentinian writer and anthologist, is endowed with literary acumen, sensitivity, urbanity, and an encyclopedic memory of Jorge Luis Borges' work (in his prologue, Borges jokes that Sorrentino knows his work "much better than I do"). Borges wanders from nostalgic reminiscence to literary criticism, and from philosophical speculation to political pronouncements. His thoughts on literature alone run the gamut from the Bible and Homer to Ernest Hemingway and Julio Cortázar. We learn that Dante is the writer who has impressed Borges most, that Borges considers Federico García Lorca to be a "second-rate poet," and that he feels Adolfo Bioy Casares is one of the most important authors of this century. Borges dwells lovingly on Buenos Aires, too. For seven afternoons, the teller of tales preceded me, opening tall doors which revealed unsuspected spiral staircases, through the National Library's pleasant maze of corridors, in search of a secluded little room where we would not be interrupted by the telephone…The Borges who speaks to us in this book is a courteous, easy-going gentleman who verifies no quotations, who does not look back to correct mistakes, who pretends to have a poor memory; he is not the terse Jorge Luis Borges of the printed page, that Borges who calculates and measures each comma and each parenthesis. 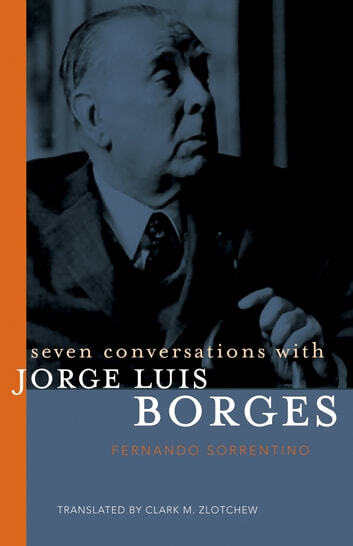 Sorrentino and translator Clark M. Zlotchew have included an appendix on the Latin American writers mentioned by Borges. Fernando Sorrentino is an Argentine writer born in Buenos Aires in 1942. His works have been translated into more than twelve languages. Clark M. Zlotchew is a professor of Spanish at SUNY Fredonia. Some of his areas of specialization: Jorge Luis Borges, 20th century Spanish-American Fiction, Literary Translation, and Literary Interview.